Pinoy Big Brother Update: PBB All In Episode August 11, 2014: Yesterday, Manolo went out of the PBB House due to the decision of the people that Jane will have to stay inside the house for a chance to be included in the Big 4. The housemates went through a lot of challenges that they needed to surpass for this week. On this episode, the housemates were able to meet one of the most prominent and talented actress in the television today, Mrs. Judy Anne Santos-Agoncillo. The housemates were amazed when they saw Judy Anne inside the house. Big Brother gave instruction to the housemates that they needed to do a particular task that will determine their position inside the PBB House. They will have to go through a question and answer portion but this time the questions are related to the former housemates on how well they know them. 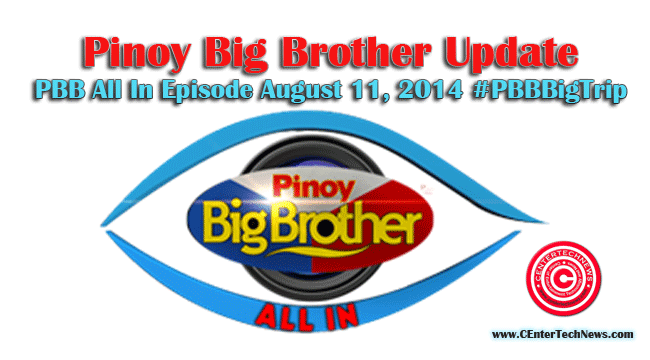 Update: PBB All In Episode August 12, 2014 #‎PBBPowerToVote‬ here. Related: Who will be the The BIG 4 of PBB All In? The task was hosted by Judy Anne since she is a host of different contests on television. The housemates were given a time to answer the questions and the moment they do this well, they will gain points. The number of points was tabulated and the housemate with the highest point will be automatically safe from the nomination. On the other hand, Big Brother talked to Joshua and dealt with the issue about being “lazy” inside the house since this was attached to his name for so many days. There were so many housemates who noticed and complained about his being lazy though looking at the tasks, Joshua is the one who is excellent in them. Big Brother then said to Joshua that being industrious doesn't depend on situation and he needed not to be part of the Big 4 just to show it. Joshua was emotional that time. Going back to the task where the housemates needed to answer the questions correctly to be safe, the competition was tough. In the end, Vickie got the highest point of 6 that made her the first housemate to be safe from the eviction. Vickie was speechless of the announcement. The housemates will have to face the next round of the game wherein they have the power to save someone from nomination. With regards to the details of the next round, we will know them tomorrow. Things are really getting tougher as the housemates have exceeded the 100th day inside the PBB House. What would be the result of this task? Well, let's read what happened on August 12 episode here.